College Level Examination Program or CLEP test provides students of any age with the opportunity to demonstrate college-level achievement through a program of exams in undergraduate college courses. There are 2,900 colleges that grant credit and/or advanced standing for CLEP tests. Each institution determines for which CLEP exams credit is awarded. Therefore, before you take any CLEP tests, check directly with the college or university regarding the specifics of its policy. This interactive CLEP math tutorial software contains all the topics necessary for success on these CLEP exams as well as college math placement exams. 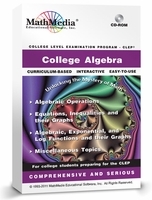 Algebra 2 and College Algebra students as well as those students preparing for the college math placement exam will get the algebra help they need from this CLEP test prep software with a sample CLEP test. CLEP testing is becoming more and more popular for students with time constraints caused by family, jobs, and finances. CLEP testing is an easy and convenient way to gain the college credits necessary. CLEP tests are available for every subject. As college courses become more expensive, taking several CLEP exams makes a lot of sense. 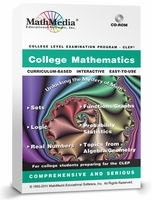 MathMedia CLEP math software provides CLEP college math exam practice and review for CLEP college math, CLEP college algebra, and CLEP college trigonometry -- CLEP Pre Calculus combines trigonometry with college algebra. CLEP exams provide students with limited time or funds the opportunity to satisfy college requirements - MathMedia provides the math software for students to prepare properly and thoroughly for these math CLEP exams. MathMedia software programs are comprehensive CLEP study guides with a sample CLEP test. 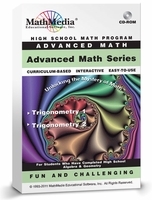 This interactive clep math practice is packed with college precalculus help and ample practice with complete solutions, these math computer programs provide an individualized approach for students requiring a CLEP math tutorial to prepare for their College Mathematics CLEP exam or to prepare for Algebra 2 placement tests and the college placement exam in mathematics. Typically, how long does it take to complete one of these CLEP practice programs? Will it prepare me for the clep test? Yes, if you complete the specific clep program you need to study and you understand the material, you will pass the CLEP exam. Along with the included practice CLEP tests, there are over 60-100 learning and explanation sections - these learning sections will take between 30-60 minutes to complete. We will be your CLEP tutor. If you dedicate the time and discipline, you will be successful. Note: The download for downloadable products will be available to you at the end of the checkout process. For a closer look at sample screens and to learn more about these CLEP study guides, please scroll down. Click on the title you wish to review. "Drill down" to the sample screens.